Gov. 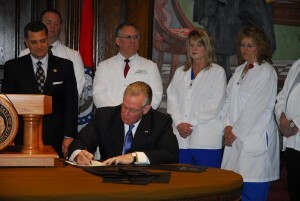 Nixon came to Cape Girardeau today to sign House Bill 1498, which requires health insurance companies in Missouri to speed up claims payments to doctors, hospitals and other health care providers. Nixon says rural providers, especially those in poor rual areas such as in Southeast Missouri, are hard-hit by long delays. Director of the Missouri Department of Insurance John Huff points to a 2009 report from his agency that shows health care providers across the state are dealing with significant payment delays in the claims filed with insurance companies for treatment of patients. The report says more than 26 percent of claims at Missouri hospitals are past due by 90 days or more. “While the average urban hospital reported 25.6 percent of claims more than 90 days past due, for rural hospitals the figure was 37 percent. For the hospitals in southeast Missouri who responded, 53 percent of claims were 90 days or more past due,” the department says. Nixon says the new law clearly spells out responsibilities for providers filing claims, giving providers and insurers a clear definition of a clean claim; requires insurers to either pay or deny claims within 45 days of receipt. Insurers will no longer be allowed to “suspend” claims, which can delay payment indefinitely; and insurers that don’t pay claims within 45 days will pay a daily penalty to the health care provider of one percent of the outstanding claim. Nearly 70 hospitals were researched in compiling the report, which accounts for about 70 percent of the hospital market in Missouri. HB 1498 was sponsored by Rep. Tim Jones (R-Eureka), and was handled in the state Senate by Sen. Jim Lembke (R-St. Louis).